Cranky sparrows! I love the word "hedgerow." I makes me think of Peter Rabbit and long for a cup of tea. 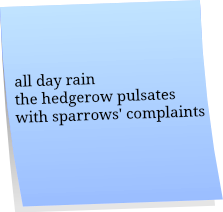 It rained here all day yesterday, and I was ready to join the sparrows in their crankiness!